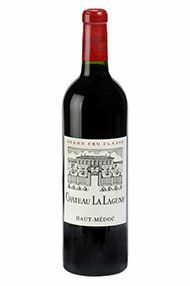 Château La Lagune is a 3éme Cru Classé property that produces some of the finest wines in the Haut-Médoc AC. La Lagune's history dates back to 1715 when its handsome château was constructed. The vineyards were first planted in 1724. La Lagune had hit hard times and fallen into disrepair when Georges Brunet bought it in 1954. He replanted the vineyards and totally renovated the chai. By the time he sold it to the Ayala Champagne firm in 1961, the property had been transformed. La Lagune is the first property you pass driving out of Bordeaux on the Route de Vins. It is in fact only 15 kilometres from Bordeaux city. There are 72 hectares of vineyards planted with Cabernet Sauvignon (60%), Merlot (20%), Cabernet Franc (10%), and Petit Verdot (10%). The grapes are fermented in temperature-controlled, stainless steel tanks and the wine is then aged in oak barriques (70-80% new) for 15-18 months. The palate here offers everything that one could wish for. With strong concentration, black fruit flavours – blackberries and blackcurrants, all wrapped together with silky spice.